Here I will add photographs and information on civil Mustangs, especially from the 'early' years, when Mustangs were bought from surplus stocks. 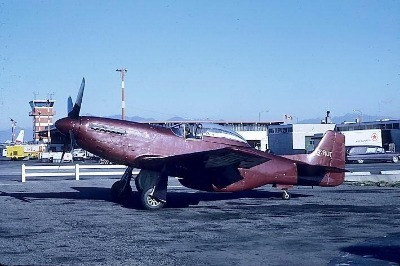 Some aircraft were put on static display in strange schemes before adopting civil identities and - this is P-51D-20-NA 44-63810 at The Air Museum, Ontario, CA, during the late 60's. 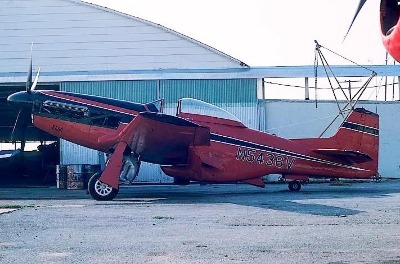 N311G, former P-51D-20-NA 44-72145, in a striking red & white scheme with a dark blue trim, at Oshkosh, 1970 - this is a veteran that had seen service with the 188th FS NM ANG; first civil registration had been N6169C (Steve Williams). N6344T, former P-51D-25-NA 44-72826, in black & white livery plus silver trim, at Oshkosh, 1970 - this aircraft had seen service with the RCAF; delivered on 7th June 1947 as RCAF 9563 - the civil registration N6344T was adopted in September 1960 (Steve Williams). 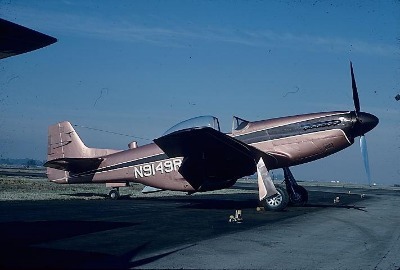 N5423V, former P-51D-30-NT 45-11586, held in a dark and medium brown with white finish, at Oshkosh, 1970 - this a/c previously had seen service with the 167th FS WV ANG (Steve Williams). N5471V, former P-51D-30-NT 45-11381, in a gorgeous looking red & white scheme with black trim on take-off at Oshkosh, 1970 - it is another survivor that had seen service with the 167th FS WV ANG (Steve Williams). N6306T, former P-51D-30-NA 44-74878, white with red, at Oshkosh, 1970 - this is a former RCAF aircraft which was delivered on 10th January 1951 as RCAF 9259 - it adopted civil registration N6306T in September 1959 (Steve Williams). 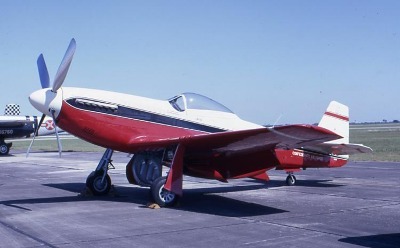 Cavalier conversion N2251D, former P-51D-30-NA 44-74427, at Oshkosh, 1970 - this aircraft was heavily damaged the same year by an exploding oxygen bottle during the refilling procedure - this aircraft is a former RCAF example, having been delivered on 8th November 1950 as RCAF 9592 - it served with Nos. 403 and 442 Sqdn as well as Air Amament School before being sold as surplus during the late 50's. First civil registration was N9148R in October 1959 (Steve Williams). 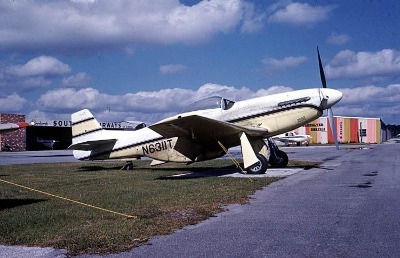 N9149R photographed in 1968 - former P-51D-30-NA 44-74441, it was delivered on 8th November 1950 to the RCAF as RCAF 9593 - sold as surplus to the U.S. civil market, it was registered N9149R in October 1959 - this aircraft is reported to have gone through the Trans Florida facility at Sarasota, FL. - Sadly, this aircraft was completely destroyed in a crash on 30th December 1972. N103TL, former P-51D-25-NA 44-73422 - this aircraft was delivered to the RCAF (Royal Canadian Air Force) on 8th February 1951 as RCAF 9287 - sold as surplus in 1956, it initially was adopted civil registration N6401D in December 1956 - re-registered N103TL and later N10539; this is one of the airframes that went to the Salvadorean AF in July 1969 - its subsequent history and fate is unclear. The above photograph was taken in February 1967. 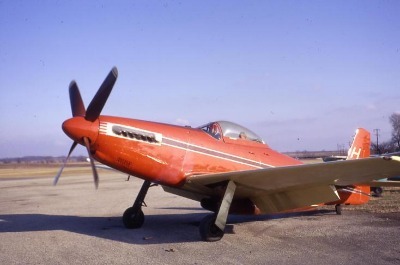 N6311T photographed in 1966, former P-51D-25-NA 44-73435; this is another former RCAF aircraft, it was delivered on 8th February 1951 as RCAF 9290; after retirement, this aircraft first received Canadian civil registration CF-MWN in November 1960 and later was sold to the U.S. and registered as N6311T - this aircraft was completely destroyed in a crash on 6th July 1968. CF-RUT photographed in 1967 - it is former F-51D-25-NT 44-84933; after having served with 178th FS ND ANG, 133rd FS NH ANH and 167th FS WV ANG, it was put up for disposal and sold as surplus at McClellan AFB, CA, in September 1957 and was registered N2874D and went through various owners until sold to Canada in August 1965 where it was registered CF-RUT (as seen in the photo) - during December 1967 it was sold back to the U.S. and was registered N201F - this a/c is still airworthy. 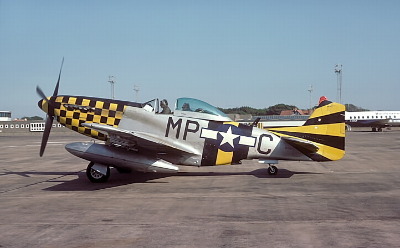 N119H, former P-51D-25-NA 44-73275, seen here with the Confederate Air Force at Harlingen, TX, in 1967. 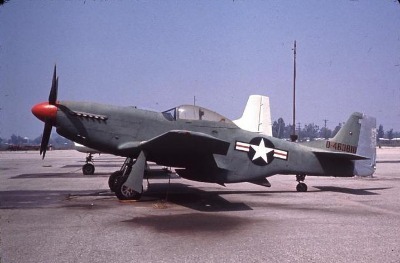 Before being sold as surplus at McClellan AFB in 1957, it had seen service with the 178th FS ND ANG and the 179th FS MN ANG and is reported to also have served with the 108th FS IL ANG. This aircraft is still airworthy. 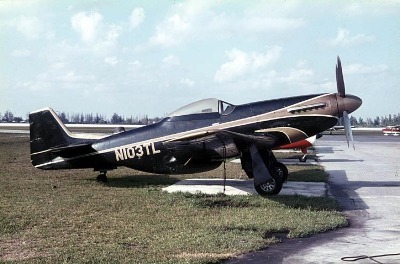 P-51D-25-NT 44-84753 seen here in 1966 when registered N5436V. this aircraft previously had seen use as training aircraft with the 131st FBG USAF and later the 165th FS KY ANG. Later registrations were N51TC and N251BP. The aircraft is airworthy. Of the 555 P-51H's built, only a handful survived to this day. This is N313H photographed in February 1967 - being former serial # 44-64415, it went to NACA as # 130 at Moffett Field, CA, on 5th August 1946; the aircraft was modified and operated with gunsight tracking and guidance and control displays from 12th October 1946 until April 1961 - some sources, however, state, that the last flight actualy was made in 1958; after being sold on 23rd June 1961 it adopted civil registration N313H which later was changed to N49WB. P-51D-20-NA 44-73027 N5747 seen here transitioning through Prestwick on 15th June 1977, when it arrived in the UK for a brief period, attending a few airshows during that year. This aircraft soon returned to the U.S. where it was later involved in two crashes with ensuing rebuilds, using substantial components of an ex-AURI airframe, before it returned to Europe as F-AZJM. This is in fact the same aircraft (although few parts of the original aircraft as seen here remained by then) that eventually crashed in September 1998 in the Swiss mountains, shortly after being registered HB-RCW - this is another former RCAF example, having been delivered on 6th December 1950 as RCAF 9250 (Dave Jones). 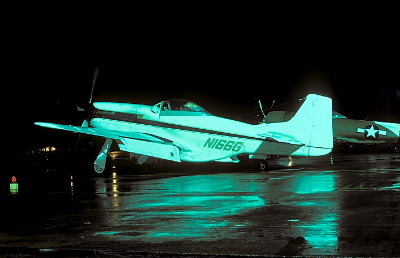 Great night-shot of P-51D-20-NA 44-63788 N166G transitioning through Prestwick on 10th November 1979. This aircraft, reportedly an ex FAN-airframe (Nicaragua) had been registered N6171C, N335J and N3350 before becoming N166G; it was re-registered G-PSID in the U.K. (1981) and later (1988) F-AZFI in France where it was lost in a fatal crash in 1998 - this is another example that had seen service with the 167th FS WV ANG (Dave Jones).